Course management is how a player thinks and plots their way around the course. Good course management covers a wide range of different skills. Because of this, experience of playing a number of rounds at different courses and in different conditions is important. A lot of course management is common sense; dont aim for the water, for example. But many players fail the course management test by not choosing the right shots, failing to identify dangers, attacking a hole when they should be playing safe and vice versa. One of the most important aspects of successful course management is a solid pre-shot routine which allows a golfer to mentally prepare for and execute a shot. Its something all the best players do and it allows them to go into any shot with a clear mind and confident manner. Here is a basic pre-shot routine you can practise and work into your game for better course management. 1. 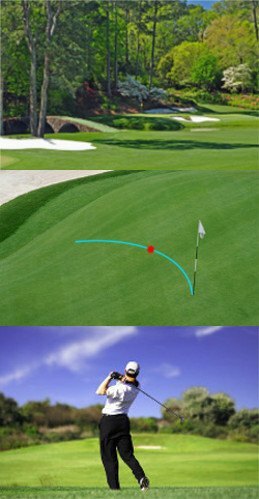 Begin the pre-shot routine from behind the ball and assess all the different elements which could affect the shot such as lie, wind direction, weather conditions, obstacles to overcome, current position in match, etc. 2. After the different elements have been weighed up, select the club to be used and the type of shot you want to play. Its vital to commit to the shot you want to play. 3. Stand behind the line of the shot and imagine the ball traveling towards your target, really try and see it fly through the air. Imagining a great shot is a way for your brain to tell the body what to do. 4. Take a few practise swings, imagining the ball flying towards the target. 5. Set up to the ball after aligning yourself to the target and let the shot go. Course management is all about selecting which shots to hit in certain situations. The ability to hit those shots has to be gained in practise before the round is played. Although golf course management is also a job title, in this instance we are talking about the ability to think when playing! Good course management is not about seeing every possible shot the same and attacking every hole at every possible opportunity. Its about having the will power and mental fortitude to put the driver away and select a more appropriate club. Good course management should be learned on the course and by trial and error.